Growing up, Jill Frechtman - an admitted chocoholic - loved white chocolate-covered pretzels so much that she started making them at home with her mom. Experimenting with different combinations of chocolates and toppings, they soon began giving their creations as gifts to friends and family. In December 2001, Jill, working as an art director at a large advertising agency in New York, made her chocolate-covered pretzels for an office holiday party. They were a hit! Jill's edible art proved to be so irresistible that everyone's raving turned into encouragement. She had to get her pretzels out there for other people to try. Using her creativity and background in design, Jill perfected various pretzel creations and designed a logo and packaging, quickly turning her passion and pastime into a business. 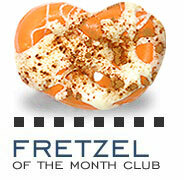 Thus, Fretzels® by Jill "Frechtman" was born.